Idiopathic scoliosis affects thousands of people every year. It is one of the three primary types of scoliosis, showing up early in a person’s life; usually just prior to the teen years. This disease causes spinal deformity, and can be mild or acute depending on several factors, including the health of the mother during pregnancy. It more often affects girls rather than boys, but takes place in both sexes. Almost all cases of scoliosis are of this type. 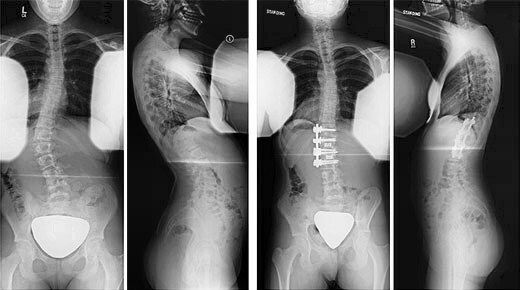 In many statistical studies, idiopathic scoliosis is the type present in almost 87% of cases. There are two other forms of the disease, called Congenital and Neuromuscular, respectively. Thus far, the disease has no ‘cure,’ and can even be fatal, but alternative therapies are being used to greatly enhance the lives of those who are diagnosed with idiopathic scoliosis. The earlier the disease is detected, the easier it is to treat, since the asymmetrical curve of the spine will progress. In scoliosis patients, the curve does not mirror the natural S-curve of the spine, but is lateral. Scoliosis can be a tricky disease to detect; it usually starts asymptomatic, meaning there is no pain or discomfort associated with the disease. More often, people will notice a slight discrepancy in their body, including one shoulder looking higher than another when standing still and straight, the head being tilted to one side, or the ribs seeming to be asymmetrical. Scoliosis cannot occur as a result of lifting heavy items or participating in sports. These types of activities can cause back pain, but that is not what causes it. Scoliosis is a neurological, neuromuscular disease, which affects the way the spine forms, usually prior to birth. These therapies include stem cell research, new medications, yoga and Ayurvedic and Chinese herbal medicines, as well as early detection and surgical correction. Idiopathic scoliosis can cause extreme, relentless pain, or mild inhibition of regular movement, but anyone that suffers from muscle stiffness and tightness in even a ‘regular’ body can empathize with the daily nuisance, if not agony that muscular degeneration or injury can cause. The spine is especially important in keeping the body working correctly, as it is literally the backbone of the entire structure, so scoliosis can be debilitating if not promptly addressed. Many medical doctors will refer to curve progression when referring to idiopathic scoliosis. Their main concern is not usually to reverse scoliosis found early on, but to stop the progression of a malformed curve to the spine. In a recent study reported in the Journal of Bone & Joint Surgery, of 100 patients followed over a forty-year period, 64% experienced curve progression. While yoga and stretching may impede the experience of symptoms, it does not usually stop the progression of an abnormal curve. This may require surgery, the use of a back brace, spinal decompression, or even other forms of scoliosis therapy. How do you get scoliosis?